The oriental city of Muscat was the destination of my recent trip together with my husband. As this was already our third visit to Oman’s capital, we are quite familiar with this city in the Middle East. there is no long transfer from the airport to beach hotels. Best travel time is from November to March as the temperatures are moderate and pleasant. Muscat is the largest city of Oman with a population of about one and a half million inhabitants. The country is ruled by Sultan Qaboos bin Said who is very respected by the residents. Before his ascension in 1970, the country was underdeveloped and almost completely closed to visitors. Under his rule, the Sultanate of Oman developed a successful economy and a multiethnic society. 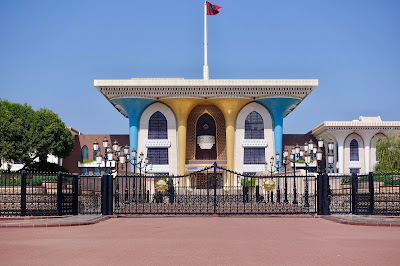 Quite different to its neighboring country of United Arab Emirates, the Omanis are usually actively working, although there is also a large number of expatriates, especially from Asia. 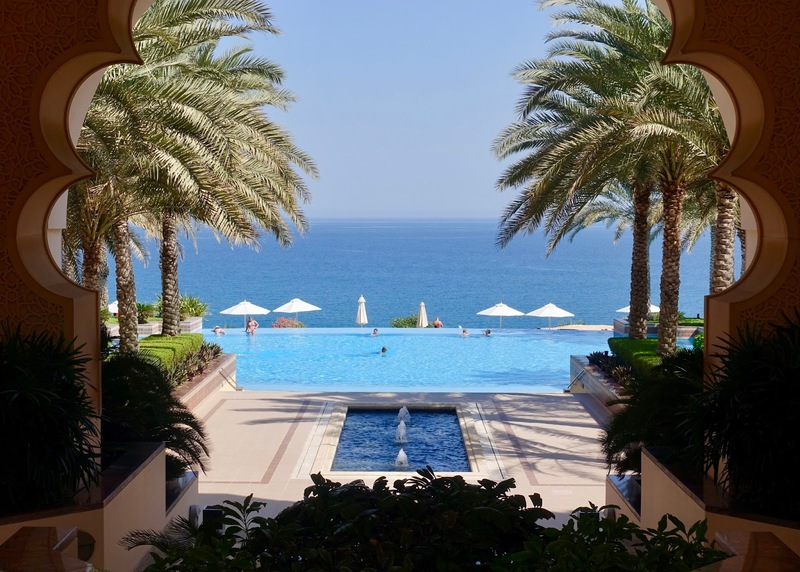 Tourism has experienced a considerable growth lately, not only in Muscat, but also in the other parts of Oman. The country has an abundance of natural beauty, from spectacular rugged mountains to serene deserts, from tranquil wadis to a pristine coastline. If you think of Muscat of another Dubai, then you are wrong. There are few high-rise blocks in Muscat and all the buildings reflect the sultanate’s heritage, an arabesque pattern here and a dome there. 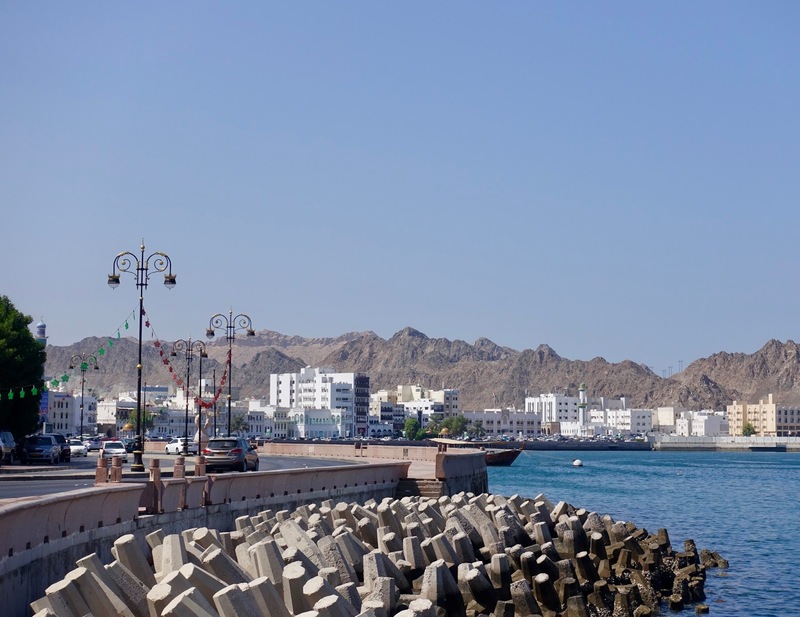 The capital is a port city sitting on the Gulf of Oman and surrounded by mountains and desert. It is attractive and clean, although quite uniform. 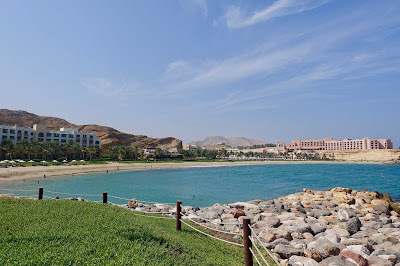 When visiting Muscat for the first time 12 years ago, I stayed at the Al Bustan Palace, formerly an Intercontinental, now a Ritz-Carlton Hotel. While I found it luxurious and well run at the time, I understand that nowadays it could do with a makeover, especially its rooms. Having said this, the location is great, set against the mountains and overlooking the sea. 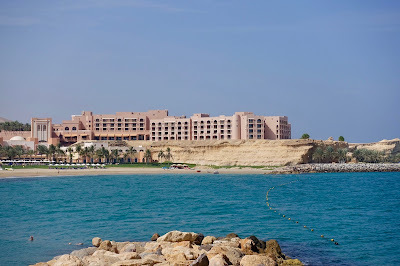 This hotel was my choice when being in Muscat 4 years ago and also on the occasion of my recent trip to Oman’s capital. The setting of this hotel is hard to beat: sitting right on top of a rock with view of the turquoise water of the Sea of Oman and with the mountains at its back. 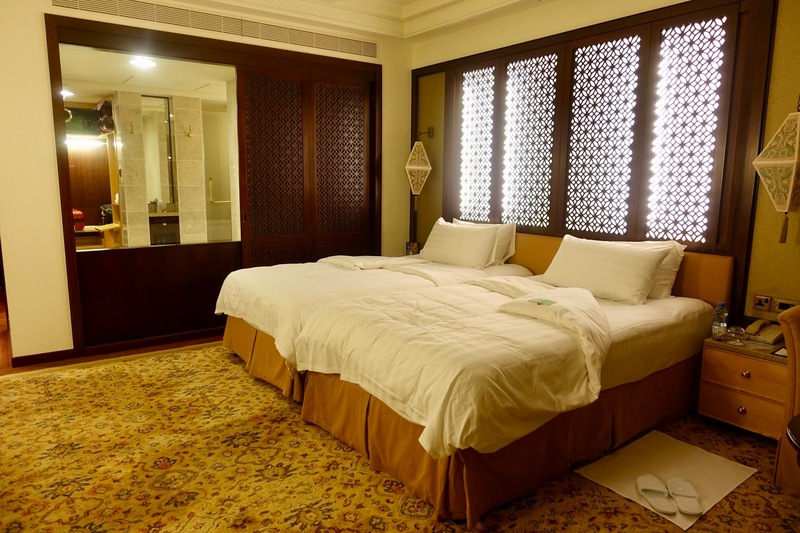 The Al Husn is the signature hotel of a hotel complex consisting of three separate hotels. Please find more information about it in the next chapter. 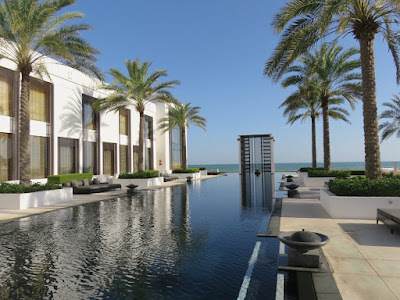 A good choice may also be The Chedi Muscat, probably Oman’s most stylish resort, but I only know it from hearsay. 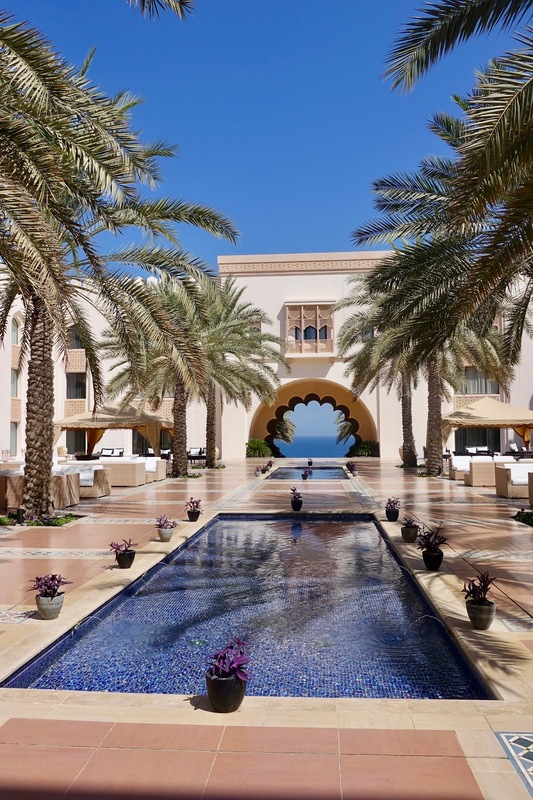 While it seems to be very chic, featuring a beachfront location and spectacular grounds, its setting is by far not as dramatic as the one of its two before mentioned competitors and it probably does not have Muscat’s best beach. As mentioned, I already stayed twice at this hotel during the last four years. I also made a review of my stay taking place four years ago. Most things are still the same as described there. We chose the same room category, a Deluxe Sea View Room, but its situation was different, on the top floor and with a better view. I liked the room better than last time although it had not undergone any visible renovation works. The slightly musty smell of last time was gone and it felt better maintained than four years ago (especially the balcony was cleaner). In contrast to the previous stay, we did not consider prices for food as too expensive, but as adequate. The Al Husn is a hotel catering to adults and also its two restaurants, Sultanah with international cuisine and Shahrazad with Moroccan cuisine, are restricted to guests over 12 years old. 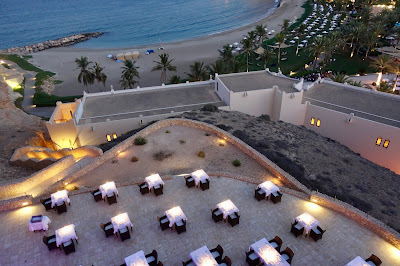 There is a number of other resort restaurants from those we only took the seafood restaurant, Bait al Bahr, into account. Generally, we had pleasant dinner experiences at these three restaurants. Our favorite is Sultanah where we not only enjoyed two delicious meals – different country themes are done there every night -, but also are fond of the outside dining on the terrace on top of a rock. A plus is also the good service we experienced there. Dinner at Sharazad, where we had a Maroccan menu, was good, but staff was under-resourced. The same can said for Bait al Bahr, where we had tasty and well prepared fish dishes, but found service not very well organized and too stressed. 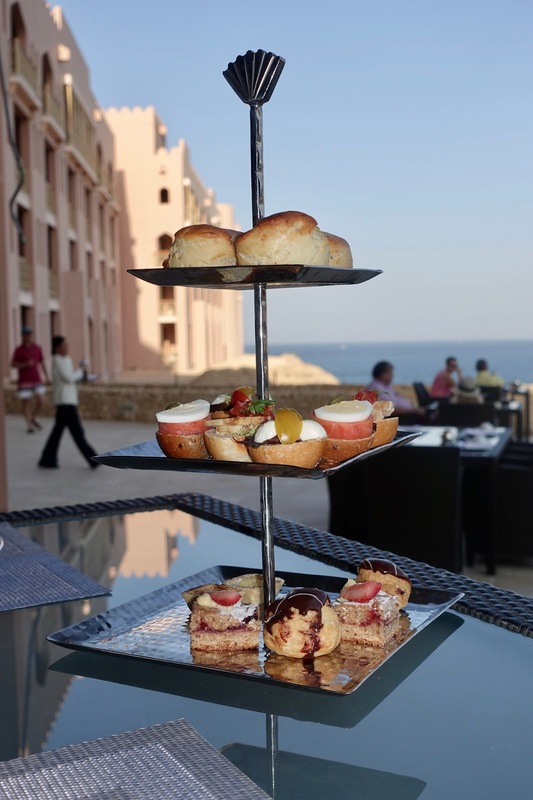 Guests of Al Husn are treated to afternoon tea at Sultanah and pre dinner drinks in the hotel’s splendid courtyard whilst listening to a harpist, a nice touch! There is also a gorgeous pool and a beautiful beach for the sole use of Al Husn guests. The atmosphere is peaceful and relaxing as there are no children allowed on the premises. 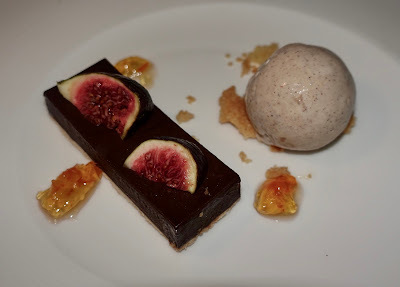 As to service, every member of staff we encountered was welcoming, helpful and cheerful. We really had a great time at the Al Husn. 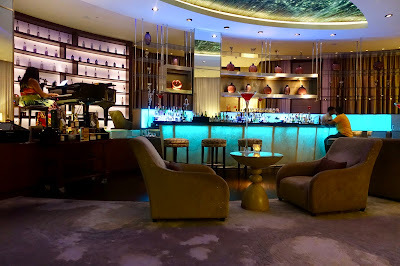 One other thing I would like to recommend outside of this hotel – but still in the Shangri-La complex – in addition to the seafood restaurant Bait al Bahar is the Piano Bar. This is a great spot to relax whilst having an excellent cocktail and listening to a fantastic piano player. I cannot give recommendations for dining outside of Shangri-La resort because we did not venture elsewhere. First, it is quite a drive to restaurants in the city center. Second, my research of Muscat’s dining spots did not result in must-do restaurants. Third, the choice of good restaurants at Shanghri-La is sufficient. 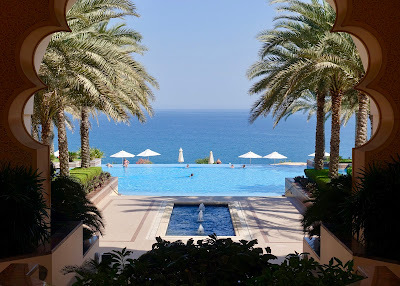 Overall, Shangri-La Al Husn is a great place when looking for a luxury hotel in Muscat with a beautiful beach, well-appointed and spacious rooms (Arabian-inspired decor), accommodating staff and good restaurants and all this appropriately priced. As already said, Oman’s capital is the perfect place for a start point for a round trip in the country and/or beach vacations. There is a handful of attractions in Muscat worth seeing, but unfortunately there is not a good selection of half-day trips in the surrounding area in order to get a real feeling of an authentic oriental country. If you want to visit the desert, wadis (dry river beds), idyllic mountain villages or other towns worth visiting (e.g. Nizwa), you need to drive at least two hours in order to reach such sights. It is a pity that there are no tourist attractions a bit closer to the capital! This impressive piece of modern Islamic architecture was a present of Sultan Qaboos to the residents of Oman after 30 years of ruling the country. It is a feast for the eyes from the outside as well as from the inside. It can be visited with a guided tour or without. 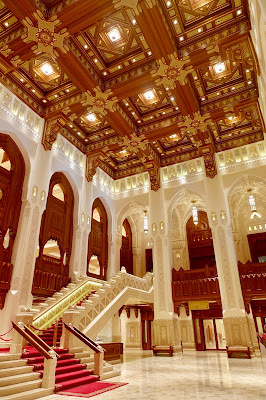 Oman’s premier venue for musical arts and culture was built on orders of Sultan Qaboos and is from the same architect as the Grand Mosque. This imposing building of contemporary Omani architecture was inaugurated in 2011. It can be visited with a short guided tour. The beautiful old woodwork deserves special attention. It is a nice place to wander through looking at the wares that are sold, anything from everyday objects to fabrics, clothes, toys, electronic devices ... 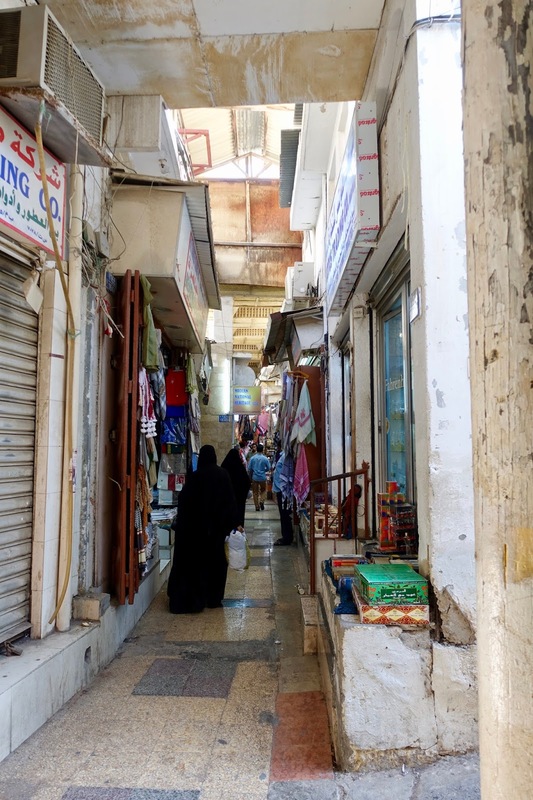 It may be not the most beautiful souq in the Arabian world, but certainly a good spot to observe locals doing their daily routine. Old Muscat is situated at the far eastern end of the capital. It can be reached from Mutrah Souq by a walk along the Corniche (waterfront) of about an hour, which actually is a nice thing to do. Old Muscat is guarded by two forts on either side of the Royal Palace of Al Alam, the home of Sultan Qaboos. The old town has recently undergone a face-lift and is attractive to look at, but unfortunately it makes the impression of being rather lifeless. 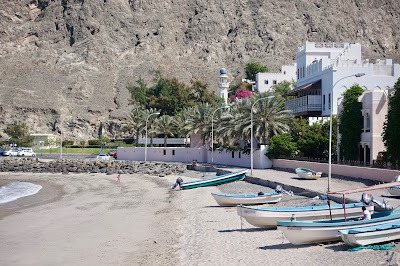 Muscat is Oman’s capital and a good starting point for a round trip in this beautiful country. If you want to enjoy Arabian nights’ delights, go there. 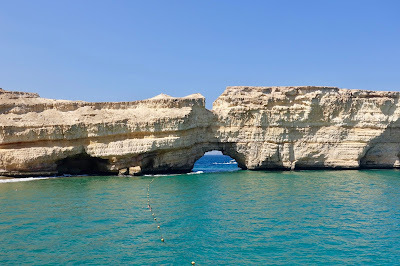 Oman is well worth a trip because of its natural beauty, its long and interesting history and the warmth of its locals. Also it is safe to travel and offers good accommodation opportunities, also for luxury travel. 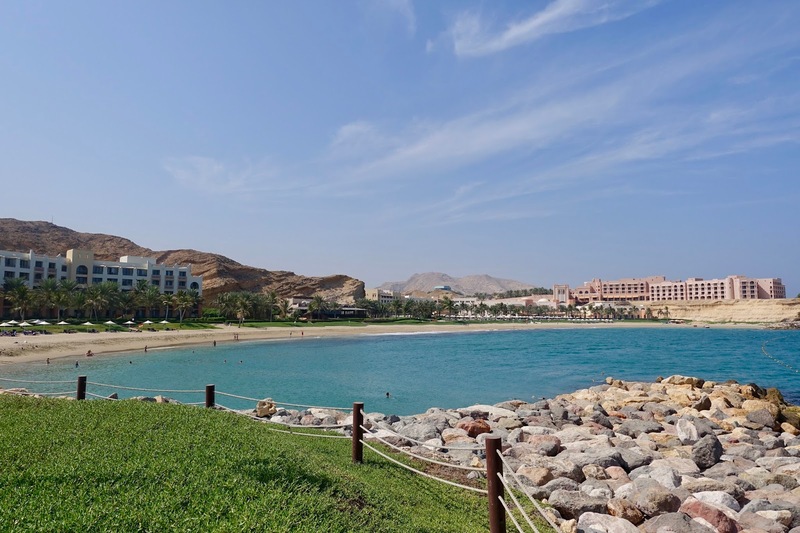 Muscat is also an ideal place for beach vacations in the winter term. 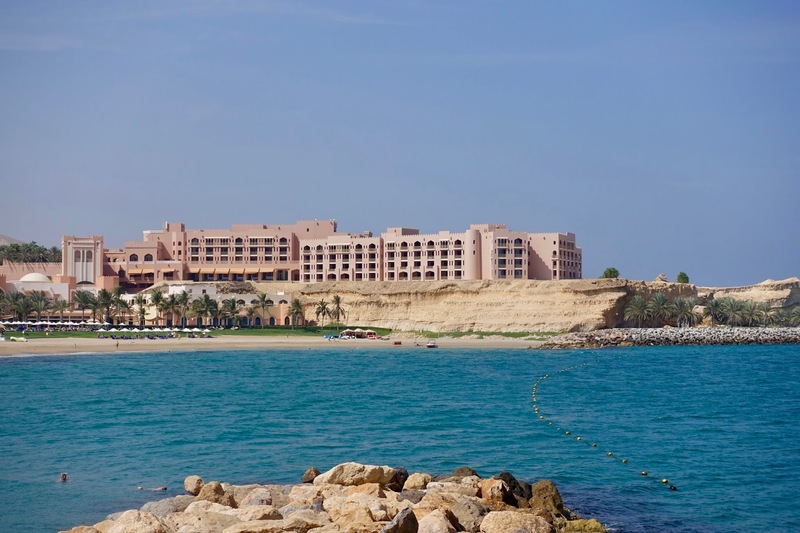 Three hotels for demanding travelers are on offer from which I recommend Shangri-La Al Husn from my own experience. A truly luxurious experience shall be almost guaranteed!